Cheshire Cat Zipper Pouch: Alice in Wonderland, Trick or Treat, Cheshire Cat Grin, Halloween. Hello! Thank you for visiting my shop. <3 Please know that this item was handmade by me on my sewing machine (not in a factory!). I made this Cheshire Cat pouch using fabric scraps left over from other projects. This zipper pouch was created using Halloween fabric featuring the Cheshire Cat on a spooky background. I paired this with a creepy smile fabric. The pouch has a black zipper and a solid black lining. 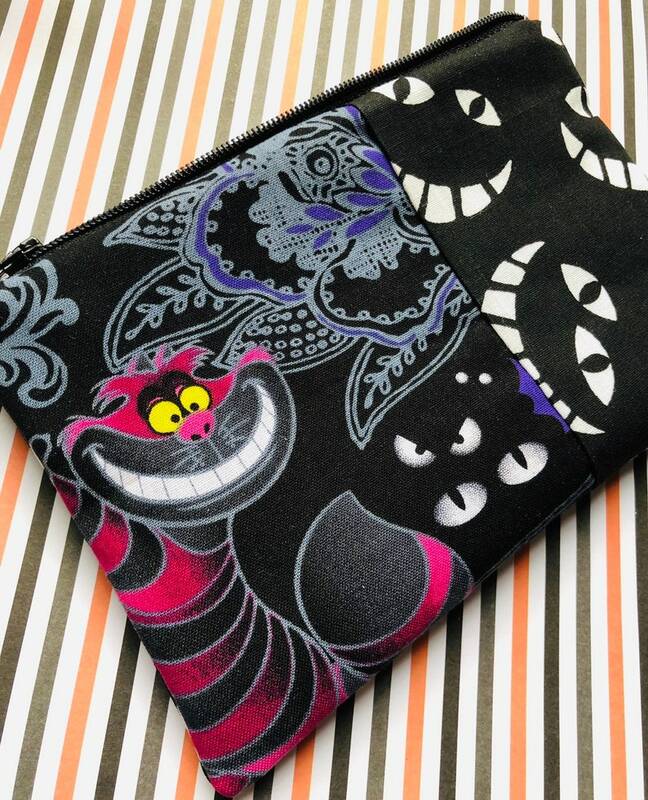 Alice in Wonderland Zipper Pouch: Cheshire Cat, Mad Tea Party. Alice in Wonderland Coin Pouch: Cheshire Cat, Mad Tea Party. Jack Skellington Zipper Pouch: Nightmare Before Christmas, Jack is Back. Alice in Wonderland Zipper Pouch: Mad Tea Party, Mushrooms, Clocks. Skulls and Bats Zipper Pouch: Halloween, Stripes. Horror Movie Monsters Zipper Pouch: Frankenstein, Werewolf, Dracula. Audrey II Zipper Pouch: Little Shop of Horrors. Fiesta Skulls Zipper Pouch: Halloween, Flowers. SALE Skulls Zipper Pouch: Skeleton, Halloween.